Climate change, agricultural runoff, and human waste have quadrupled the size of oxygen-depleted areas of the oceans singe 1950, according to a new, comprehensive study. The world’s oceans are getting choked as climate change, agricultural runoff, and human waste have fueled a 10-fold increase in the number of oxygen-poor regions worldwide. 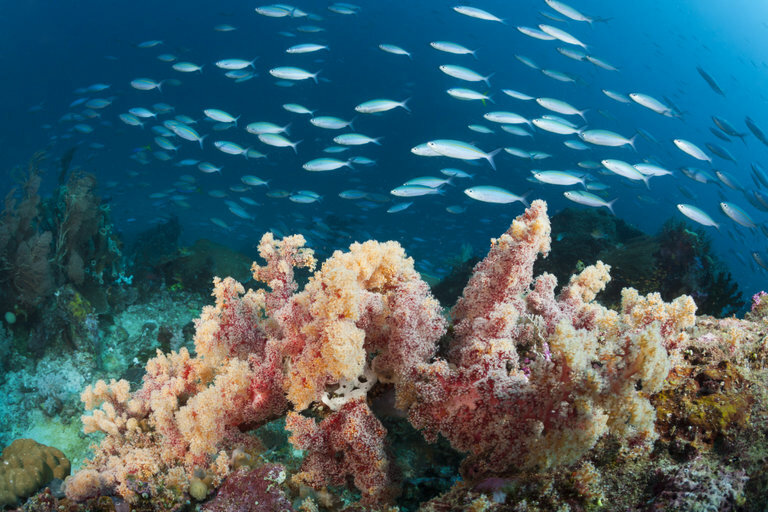 Those are the findings of an international team of scientists, who paint a grim picture of the oceans and their ability to support life. Patches of water with only minimal amounts of dissolved oxygen have grown by an area roughly the size of the European Union — more than 4.5 million square kilometers (17 million square miles) since 1950. Oxygen levels have declined sharply in large parts of the Arctic, the south Atlantic, and equatorial Pacific oceans, and the volume of water that carries no oxygen at all has quadrupled over the same period. The group’s findings were published Jan. 4 in the research journal Science. The paper compiled findings from other studies to produce a comprehensive overview of the problem, said co-author Lisa Levin, a biological oceanographer at the Scripps Institution of Oceanography in California. “It’s the first end-to-end look at the problem, from the causes to the consequences, the feedback and the solutions,” Levin told Seeker. Climate change is a large part of the reason for depletion, Levin said. Warmer water holds less oxygen. Warmer water also increases the metabolism of the creatures that live in it, so they consume more oxygen. And warm water is less dense than cold water, so it stays near the surface and doesn’t mix with cooler, deeper water to spread oxygen throughout the ocean. But the Earth’s human population has also roughly tripled in the same period. That means more food being grown and more human waste. Both are rich in nutrients and nitrogen compounds that fuel blooms of algae and plankton offshore, which then die and decay — a process that consumes more oxygen. That produces “dead zones” like the one that emerges every summer in the Gulf of Mexico, where the Mississippi River drains farm-belt runoff into the sea. “What people haven’t paid as much attention to is that the fact that warming is also exacerbating coastal hypoxia by changing precipitation patterns, causing more nutrient runoff, raising sea levels and taking out some of the wetlands that clean up the nutrients [and] by causing higher respiration rates so that the onset of seasonal hypoxia gets earlier,” Levin said. Hypoxia is a term for the low or depleted-oxygen levels in a body of water that can lead to dead zones. 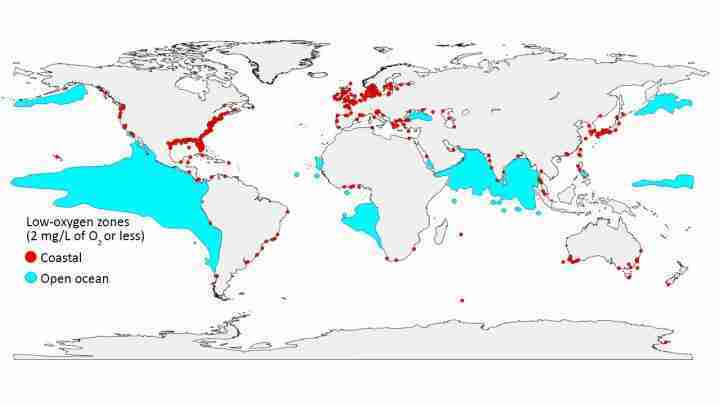 Fewer than 10 percent of the 500-plus near-shore hypoxic zones the study recorded were known to have such dead zones before 1950. And the spread of those zones affects not only marine organisms but the people who depend on them for food and money. “Low oxygen effectively become a form of habitat loss for those fish who don’t tolerate it,” Levin said. The dead zones squeeze the range where big commercial species like tuna can live and can force other species closer to the surface, where they’re easier to catch — leaving them vulnerable to overfishing. 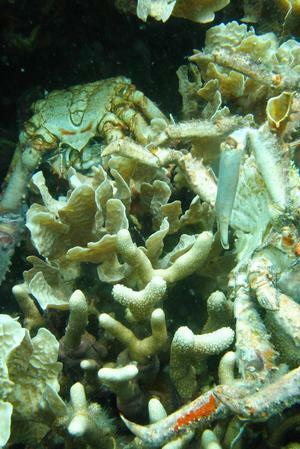 The study is the biggest survey of low-oxygen conditions across the world’s oceans. It’s also the first publication by the Global Ocean Oxygen Network, an international coalition of scientists assembled by the United Nations. Other co-authors come from Europe, Peru, South Africa, China, Kuwait, and the Philippines, as well as the United States and Canada. The review ends with a list of recommendations for policymakers that can help address the problem. Some, like reducing farm runoff, are already well-known; others, such as creating more marine preserves or eating more hypoxia-tolerant seafood, aren’t things that are at the top of the public mind, Levin said. But the biggest step is one that the world is already struggling to accomplish — cutting emissions of carbon dioxide and other planet-warming greenhouse gases.